ABSTRACT. The hawksbill turtle (Eretmochelys imbricata) is a Critically Endangered species and has been a species of interest for decades. Only in recent years attention has been focused on the populations of the Eastern Pacific Ocean. We present a genetic characterization of this species in the Mexican Pacific, based on mitochondrial DNA sequences. Six localities were sampled along the Pacific Coast, from the Gulf of California to Chiapas, between 2002 and 2007. Seventeen individuals found in marine habitats at six localities and six nests laid at three nesting sites were sampled along the Mexican Pacific. Our results show five haplotypes of 766 bp, three previously identified and two that to date were not reported. Genetic diversity indices indicate moderate to low variation for this region. Even with the small sample size reported here, our results show important relationships between the Mexican Pacific hawksbills and nesting populations of Central America and foraging areas along the Eastern and Indo-Pacific. These results, along with updated information on ecology and behavior, are essential for the future approach to conservation and management programs resulting in the recovery of this species in the Eastern Pacific. Keywords: genetic diversity, mitochondrial DNA, hawksbill turtle, endangered species, Eastern Pacific. Hawksbill turtles (Eretmochelys imbricata) are medium sized sea turtles with a circumglobal distribution throughout tropical and, to a lesser extent, subtropical waters of the Atlantic, Indian and Pacific oceans. Like other sea turtles, adult hawksbills migrate between foraging and nesting habitats; but are unique in their spongivory and algivory foraging behavior (Meylan, 1988; Leon & Bjorndal, 2002; Bell, 2013). They usually nest alone on sandy beaches, primarily under vegetation and in some cases, in mangrove estuary habitats (Gaos et al., 2012). Post-hatchlings, small juveniles (<20 cm carapace length), and migrating animals are found in pelagic areas, while larger juveniles and adults forage in benthic habitats that include coral reefs, other hard bottom habitats, sea grasses, algal beds, mangrove bays, creeks, and mud flats (Leon & Bjorndal, 2002; Gaos et al., 2012; Bell, 2013). Bowen et al. (2007) suggested that some immature hawksbills could settle in foraging areas close to their natal beaches where they will come back to nest. This is due to the phylopatric characteristic of sea turtle species (Mortimer & Donnelly, 2008). Recent studies in Eastern Pacific populations have shown a novel habitat use by adult hawksbills, in which they settle within confined inshore estuarine bays and even nest in mangrove estuaries (Gaos et al., 2012, 2016; Liles et al., 2015). This species is categorized on the IUCN Red List as Critically Endangered due to a drastic population decline throughout its range (Mortimer & Donnelly, 2008). The larger populations are concentrated in the Caribbean region in the Atlantic basin and in Indonesia and Australia for the Pacific Ocean. In the Eastern Pacific, the hawksbill turtle is particularly threatened, with several populations approaching extirpation (Mortimer & Donnelly, 2008). Until relatively recent times, the species was considered common along the Pacific coast of the Americas (Cliffton et al., 1982). The decline of the hawksbill population in the Eastern Pacific is tied closely to the tortoiseshell trade, because the coastal indigenous populations in the Gulf of California and along the coast of México traded tortoiseshell with the Spaniards during the colonial era (Sáenz-Arroyo et al., 2006). The Caribbean region and Indo-Pacific rookeries are the most studied populations and the best known to date. Based on those studies we know about the general nesting (Horrocks & Scott, 1991; Ditmer & Stapleton, 2012; Nishizawa et al., 2012) and feeding (Bowen et al., 1996; Blumenthal et al., 2009; Velez-Zuazo et al., 2008; Nishizawa et al., 2010) behaviors of the species, and the genetic characteristics of hawksbills in both the Indo-Pacific (Nishizawa et al., 2010, 2012, 2016; Tabib et al., 2011, 2014; Vargas et al., 2016) and Atlantic (Reece et al., 2005; Lara-Ruiz et al., 2006; Monzón-Argüello et al., 2010; LeRoux et al., 2012; Trujillo-Arias et al., 2014) basins. These genetic studies have demonstrated strong population structure within the Caribbean basin (Θst = 0.64, P < 0.01) and nearly fixed differences between nesting areas in northeast and northwest Australia. The evidence suggests that natal homing predominates, but breeding populations may encompass several proximal nesting sites (Bass et al., 1996; Bowen et al., 2007; Gaos et al., 2016). Recent studies in remote sites like the Persian Gulf, islands in South East Asia and Japan, have revealed the presence of endemic haplotypes in hawksbill nesting and feeding colonies (Nishizawa et al., 2012, 2016; Tabib et al., 2014). Unfortunately, the Eastern Pacific has remained under-studied until the last decade. Seminoff et al. (2003) suggest that the Tres Marías Islands may have been an important breeding area for the hawksbill turtle. Nonetheless, when compared to historical accounts of marine life from the 16th to the 19th centuries in the Gulf of California, current data reveal a significant decline of the populations in this region, even though apparently the Eastern Pacific hawksbill was never as common as in others regions (Gaos et al., 2010). There are reports of small numbers of nesting hawksbills along the Eastern Pacific from the Gulf of California to the northern coast of Ecuador; but these nesting events have diminished in the last 20 years (Cornelius, 1982; Seminoff et al., 2003; Gaos et al., 2006; Mortimer & Donelly, 2008). Recent exhaustive monitoring efforts along the Eastern Pacific, led by Iniciativa Carey del Pacífico Oriental (ICAPO) through its network collected historical data (1982-2006) of the presence of hawksbill turtles in this region, identifying six countries with nesting sites, with El Salvador, Mexico and Costa Rica identified as the most important, and eight with in-water sightings, with major abundances in Mexico, Ecuador and Colombia. From 2007 to 2009, through its monitoring efforts, the ICAPO network reported 540 verified nests, of which 430 (79.6%) occurred in El Salvador and with lower percentages in Costa Rica, Ecuador, Nicaragua and Mexico. However, most reports (63%) of at sea observations of hawksbills occurred in Mexico (Gaos et al., 2010). These findings help set the baseline for implementing monitoring projects both in nesting and foraging sites along the Eastern Pacific, and highlighted the importance of strengthening the participation of key people such as fishermen, local communities, ecotourism operators and of promoting efforts to identify, study and protect nesting sites and in-water aggregations and identify new ones. Since 2010, several studies have focused on the Eastern Pacific hawksbill. Liles et al. (2011) recorded more than 300 nesting events on the beaches of El Salvador in the 2008 season. Trujillo-Arias et al. (2014) identified two haplotypes from seven juveniles found in Colombian Pacific waters. Gaos et al. (2016) report the first genetic characterization of nine hawksbill rookeries in the Eastern Pacific region, reporting a low genetic and haplotypic diversity compared with Indo-Pacific and Caribbean populations, but found strong stock structure among the main rookeries in Central America. They included eight samples from Costa Careyes in Mexico, all with the same haplotype (EiIP33); this haplotype was found widespread throughout Central America and the Indo-Pacific nesting sites (Vargas et al., 2016) and is present in Southeast Asia foraging grounds (Nishisawa et al., 2016). ICAPO and the Marine Turtle Specialist Group (MTSG) emphasized the need to develop studies in the Eastern Pacific region to help better understand the nature of this population and its current decline, as this region is likely one of the most endangered sea turtle populations (Mortimer & Donnelly, 2008). The goal of this paper was to characterize the genetic identity of the Mexican Pacific hawksbill at nesting and foraging sites, and to investigate their relationship to rookeries recently characterized in the Eastern Pacific and others regions. Between 2002 and 2007, hawksbill turtle localities were surveyed along the Pacific coast of Mexico, chosen based on local knowledge of the occurrence of the species. For nesting sites (i.e., Oaxaca, Guerrero and Jalisco) samples consisted of collecting a small amount of blood from live hatchlings or a small amount of muscle from dead hatchlings recovered from nests, sampling one hatchling per nest. In marine localities (i.e., Chiapas, Oaxaca, Guerrero, Jalisco, Sinaloa and Gulf of California) hawksbill turtles were located and captured by hand during daytime snorkeling or scuba diving surveys (Guerrero and Jalisco), stranded individuals (Gulf of California) or in captivity (Chiapas, Oaxaca, Sinaloa). Blood (about 1 mL) was taken from the dorsal cervical sinus of individuals, following the protocol outlined by Owens & Ruiz (1980) and stored in a lysis buffer (pH 8) (Longmire et al., 1997); tissues were stored in 90% ethanol for transport to the laboratory. After obtaining samples, juveniles and adults individuals were tagged using standard metal tags. Approximately 2 mm of collected tissue was ground in Chelex 5% (w/v solution) for total genomic DNA extraction following the method suggested in SingerSam et al. (1989). A fragment of the mtDNA control region (837 bp) was amplified with polymerase chain reaction (PCR) using primers LTEi9 (5'-gggaataatcaa aagagaagg-3') and H950 (5'-gtctcggatttaggggttt-3') and internal primers (DLint1H and DLint2L) developed by Abreu-Grobois et al. (2006). DNA amplification was conducted in Peltier-effect thermo-cyclers (ABI GeneAmp PCR system 2400) using the following parameters: one initial cycle at 95°C for 120 s, followed by 35 cycles of the following temperature regime: 30 s at 95°C, 30 s at 45°C, and 150 s at 72°C. In addition, we included a final extension step of 2 min at 72°C. All PCR reactions were conducted along with positive and negative controls to detect potential false positives because of contamination. Successful amplifications were purified using the GeneJET PCR Purification Kit (Thermo Scientific). Purified PCR products were subjected to cycle sequencing using the ABI Prism BigDye Terminator v3.1 Cycle Sequencing Kit, following the protocol suggested in the kit instructions. The excess of Taq dideoxy terminators was removed with Centri-Sep spin columns (Princeton Separations Inc.) in a variable speed microcentrifuge at 2500 rpm for 2 min. Final purifications were dried down in a vacuum centrifuge and suspended in 25 mL of loading solution. Sequencing products were subjected to capillary electrophoresis in the ABI Prism 310 DNA Sequencer (PerkinElmer, Waltham, MA, USA). Fragments were sequenced and evaluated for both forward and reverse reactions to ensure accurate data collection. Sequence files were analyzed and aligned using Sequencher v5.0 (Gene Codes Corp., Ann Arbor, MI, USA). Haplotypes were identified and assigned by collapsing the sequences using the computer software TCS v1.21 (Clement et al., 2000) and then searching in the database on GenBank (http://www.ncbi.nml.nih.gov) for sequences within our reading frame. To assure broad comparisons of our results with previous studies, our alignment of the Control Region sequences had to be trimmed to a length of 766 bp (LeRoux et al., 2012). Each haplotype was compared to previously assigned haplotypes and named using the standardized nomenclature conventions recently established for the hawksbill turtles (LeRoux et al., 2012; Gaos et al., 2016; Nishizawa et al., 2016; Vargas et al., 2016). The dataset was divided into two groups: the Nesting group (i.e., samples obtained from hatchlings at nesting sites), and the Marine group (i.e., samples obtained from individuals captured at marine habitats). This division was established because of the migratory behavior of the species. Therefore, the origin of the individuals caught in marine sites is unknown. The genetic variation for each group was evaluated using empirical descriptive values such as haplotype diversity (h), nucleotide diversity (π) (Nei, 1987) and segregated sites (S) (Nei & Kumar, 2000). These values were obtained using the program DNAsp v5.0 (Rozas et al., 2003). We used the program TCS ver1.21 (Clement et al., 2000) to infer minimum-spanning (parsimony-based) networks for the haplotypes. In spite of five years of collection effort, only 23 samples were obtained (Table 1). For the 23 individuals, we sequenced an 837 bp fragment that spanned 40 bp of the tRNA-Pro and 797 bp of the 5 'end of the mitochondrial control region. This region included the 380 bp and 766 bp segments previously sequenced in population genetic analyses of hawksbill turtles from other geographic zones, incorporating two new polymorphic sites for this extended segment. This survey identified six segregated sites among the sequences, four were transitions (G-A), and two were transversions (T-A). This variation recovers eight 837 bp undocumented haplotypes from the Mexican Pacific. The overall base composition for this fragment was A = 32.7%, C = 20.9%, G = 13.3%, and T = 33.1%. DE: dead embryos, I: immature, A: adults. The eight 837 bp haplotypes identified were trimmed to 766 bp to be able to compare with previous studies, resulting in five haplotypes, three of which have been previously identified at rookeries and two of which that have not (Table 2). The three haplotypes previously identified, EiIP33, EiIP23 and EiIP106 (GenBank Accession Numbers KT934080, KT934070 and KR012503 respectively), are also found in nesting rookeries in Central America (Gaos et al., 2016); EiIP33 and EiIP23 have been identified in Indo-Pacific rookeries as well (Vargas et al., 2016), with EiIP33 being widespread in these two regions. Haplotypes EiIP33 and EiIP106 were identified in foraging grounds, EiIP33 at three Southeast Asian localities (Nishiwaza et al., 2016) and EiIP106 along the Colombian Pacific (Trujillo-Arias et al., 2014). The two new haplotypes identified, EiIP132 and EiIP133 (GenBank Accession numbers KJ603532 and KJ60 3534) were found in samples from Oaxaca and the Gulf of California, respectively. along the Pacific coast of Mexico. N, M indicate Nesting and Marine sites respectively. Oaxaca, Gue: Guerrero, Jal: Jalisco, Sin: Sinaloa, GC: Gulf of California. The data gathered from six samples collected at nesting sites revealed the presence of two 766 bp haplotypes, EiIP23 and EiIP33 (Table 2). The genetic indices for these sites show moderate nucleotide diversity (π = 0.00078), and an average pairwise difference between sequences of k = 0.60 (Table 3). The parsimony network (Fig. 1a) shows the two haplotypes separated by one mutation. Both haplotypes have been identified in nesting sites in Central America (Gaos et al., 2016) and the Indo-Pacific region (Vargas et al., 2016). Gaos et al. (2016) identified the haplotype EiIP33 for one Mexican nesting rookery. hawksbill in the Mexican Pacific. of Eretmochelys imbricata in the Mexican Pacific. proportional to the frequency of the haplotype. Lines represent mutational steps between haplotypes. Position of the segregate site is indicated above the line. The analysis of the 17 individuals sampled from marine surveys showed five haplotypes (Table 2). The genetic diversity indices (π = 0.0012 and k = 0.941; Table 3) were similar to those estimated for the haplotypes found at the nesting site. Three of the five haplotypes (EiIP23, EiIP33 and EiIP106) have been identified for nesting sites in Central America (Gaos et al., 2016), with EiIP23 and EiIP33 also found in the Indo-Pacific region. Haplotypes EiIP33 and EiIP106 were identified in foraging grounds in Southeast Asia and Colombian Pacific respectively (Trujillo-Arias et al., 2014; Nishizawa et al., 2016). Two new haplotypes EiIP132 and EiIP133 were identified and registered in GenBank under the accession numbers: KJ603532 and KJ603534, respectively. 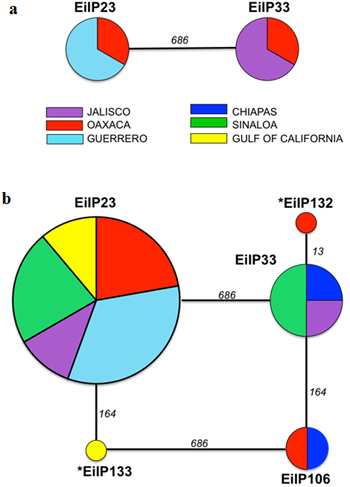 Haplotype EiIP23 was the most common and widespread, observed in nine samples (53% of all marine samples) along the Mexican Pacific, from the Gulf of California to Oaxaca, followed by EiIP33 (23.5%) and EiIP106 (11.8%). Haplotypes EiIP132 and EiIP133 were found in only one juvenile hawksbill turtle at each of two sites; Oaxaca and the Gulf of California. The parsimony network (Fig. 1b) shows a pattern that supports a recent population expansion. The more common and widespread haplotype EiIP23 is associated with several closely related haplotypes. Based on the root probability criterion (Castello & Templeton, 1994) haplotype EiIP23 is identified as ancestral for the Mexican Pacific hawksbill. Efforts at studying Eastern Pacific hawksbill turtles have suffered from low sample representation, with most samples coming from juveniles and stranding captures. Seminoff et al. (2003) reported 27 captures in four years along the Gulf of California, Gaos et al. (2006) reported eleven observations in nine years in Costa Rica. Trujillo-Arias et al. (2014) reported only seven juveniles from Pacific Colombia. In the Mexican Pacific, specifically, reports have been scarce. Gaos et al. (2016) in the study with the highest sample size to date in the Eastern Pacific (n = 269), only gathered eight samples from one locality in Mexico, identifying one haplotype. One explanation for this low sample size in Mexico is that in the Eastern Pacific this species occupies inshore estuaries, and even nests in mangrove estuaries. This is a recently described behavior (Gaos et al., 2012, 2016), which make them difficult to discover, and to sample nesting individuals. Additionally, the extreme difficulty in gathering hawksbill tissue samples (especially from nesting individuals) is a direct result of the low density of the species in the Eastern Pacific. Regardless, this study represents the first assessment of the genetic identity of this species at Mexican Pacific foraging sites and expands the knowledge about the genetic identity at nesting rookeries. The observed number of haplotypes at nesting sites within this geographic zone is important and similar to the number of haplotypes identified in others regions with low sample size. For instance, Gaos et al. (2016) identified three haplotypes in ten samples from the Osa Peninsula in Costa Rica and one haplotype from one sample from Azuero Peninsula in Panama; both sites have an estimated number of nesting females similar to that estimated for Mexico in the same study. Regardless, through their attempts to improve the sample size and find specific haplotypes or genetic structure from these nesting rookeries, the results of these studies show the need for and importance of developing local conservation programs for the recovery of these small populations. It is possible that the confluence of multiple migratory stocks in the Mexican Pacific may explain the haplotype diversity observed in hawksbill turtles sampled in marine sites. The information gathered here and in other recent studies let us provide putative place of birth for the specimens carrying haplotypes identified in the marine specimens and shared with nesting sites. Individuals widespread in Mexican Pacific waters carrying haplotype EiIP23 and EiIP33 could have their origin in Mexican nesting sites, but some of them could have migrated from the close Central American nesting sites (Gaos et al., 2016). Haplotype EiIP23 recovered widely in marine and nesting localities in Mexico is also found in rookeries from Solomon Islands (Vargas et al., 2016) and Central American (Gaos et al., 2016) nesting colonies. Haplotype EiIP33, found in nesting and marine surveys in Mexico, was found widespread in Indo-Pacific rookeries (Vargas et al., 2016) and the Persian Gulf (Tabib et al., 2011). Also, this haplotype was the most common haplotype in Central American rookeries (Gaos et al., 2016) and was identified in foraging grounds in Southeast Asia (Nishizawa et al., 2016). Haplotype EiIP106 has been identified in nesting individuals from El Salvador and Nicaragua in Central America, so the juveniles sampled in Oaxaca and Chiapas carrying this haplotype, could have their origin in those rookeries (Gaos et al., 2016). This haplotype was also identified at foraging grounds along the Colombian Pacific (Trujillo-Arias et al., 2014), suggesting that even when hawksbills nest at Central American rookeries, their foraging range extends from Mexico to Colombia. Finally, the two marine haplotypes, EiIP132 and EiIP133 have not been identified at any nesting sites; however, it is reasonable to assume that those individuals could come from some nesting colony in Mexico or Central America. This is supported by their close relationship to the haplotypes recovered from these nesting areas. This genetic relationship between Eastern Pacific hawksbills and those from other Pacific regions supports the hypothesis that some of the hawksbill hatchlings or juveniles from the Eastern Pacific could be moving to the Indo-Pacific, Persian Gulf and Southeast Asia for foraging, as this happen in others species. The recent discovery of an important nesting colony of hawksbills in El Salvador (Liles et al., 2011; Gaos et al., 2016) and others nesting rookeries suggests that the demographic dynamics of the hawksbill turtle in the Eastern Pacific is complex, and that further sampling efforts are necessary in order to understand the migration and dispersal patterns of this species. Even with the increased interest shown in the Eastern Pacific hawksbill in the last few years (Seminoff et al., 2003; Gaos et al., 2010, 2012, 2016; Liles et al., 2011, 2015), more extensive population surveys remain necessary. The results presented here provide an idea of the genetic identity of the nesting and foraging Mexican Pacific hawksbill turtles, but also shows the important role that Mexican Pacific waters play as habitat for juveniles and adults hawksbill turtles in the Eastern Pacific. Mexico has important estuarine systems along its Pacific coast that have not been explored as potential nesting sites and that, given the nesting behavior observed in neighboring populations, is required (Gaos et al., 2012). This project was made possible by the outstanding contributions of Instituto de Ecología, AC and CONACyT México. We are very thankful to the following individuals and institutions for supplying tissue samples: Centro Mexicano de la Tortuga, Universidad del Mar, Samantha Karam, Carolina Cidell, Felipe Becerril, Quiyari Santiago, Luis Mendoza, Susan Gardner, Alejandro Peña, Ana María Rivera and Alberto Abreu-Grobois. Especially we thank to the many fishermen who help in collecting samples and other fieldwork. TZM received a Doctoral Scholarship from the Mexican government (CONACyT N°164480). TZM submits this manuscript as partial fulfillment of the requirements for the Doctor of Science degree, at the Instituto de Ecología, AC. We recognize and appreciate the improvements to this manuscript thanks to suggestions and comments by Jeffrey Mangel and two anonymous reviewers.